Chris RWK and Mothership Toy Gallery and have teamed up for there first show of summer! 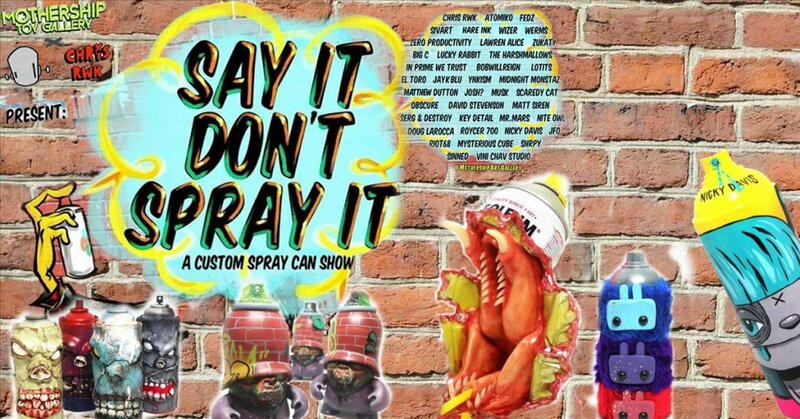 SAY IT DON’T SPRAY IT a Custom Vinyl Spray Can Show. Taking the Tool and Making it the Art! Carpets have been cleaned and ready to roll out as Mothership Toy Gallery has a huge roster of artists joining the show. These aren’t your average spray cans! •@ChrisRWK •@Atomiko •@Sivart6•@DougLaRoccaArt •@Sentrock •@WizerOneR •@Werms_Two •@ZeroProductivity •@LawrenAlice •@Zukaty •@BigC.Art •@ALuckyRabbit •@TheHarshmallows •@InPrimeWeTrust •@BobWillReign•@_Lotits_ •@ElToro215 •@JayKBlue •@Youre_Never_Komplete •@Midnite_Monstaz_New_Yuk_City •@MichaelDuttonArt •@QuestionJosh •@The_Pharaoh_Musk •@The_Scaredy_Cat •@Naito_Oru •@DavidStevenson •@MattSiren •@OfficialSergAndDestroy •@FedzArt •@KeyDetail •@MisterMarsStudiosInc •@ObscureAKG •@Roycer_700 •@NickyDavis •@The_JFo •@Riot68 •@MysteriousCube •@SHRPY_ •@Sinned_NYC @ViniChavStudio and MORE. Heres a little preview below.